Airport workers and TWU members secured a major win recently after Aerocare’s application to keep thousands of baggage handlers, cleaners and ticketing staff on low-paid, gruelling split shift work schedules was thrown out of court. The Federal Court found on 25 January that the scandal-ridden aviation services company cannot force workers to do split shifts and, effectively, rejected its exploitative business model. Aerocare – now owned by Swissport – took the action in order to maintain its low-cost business model after the Fair Work Commission in 2017 ruled its split shifts were not permissible and its rates up to $1,000 a month below the award minimum. Split-shift workers can spend 80 hours at work but only be paid for 50. TWU National Vice-President John Berger said the finding was an important win in the fight for quality jobs in aviation. “The court has implied that workers should not be used and abused by employers, brought in for three hour shifts at a time and forced to sleep on dirty floors, in cars or behind baggage carousels,” John said. John called on the Federal Government to hold companies in the airport supply chain accountable for dodgy for labour practices, including airports and airlines at the top which profit from companies like Aerocare. 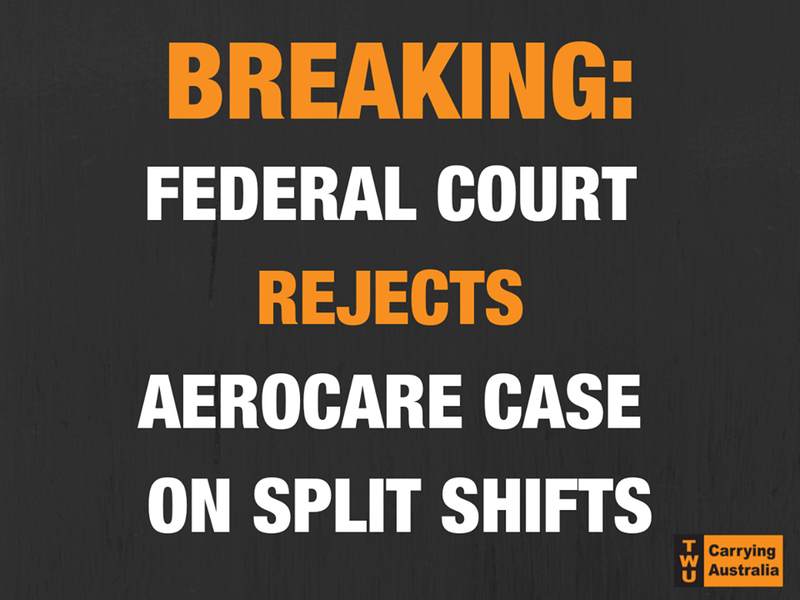 Aerocare has also been exposed over degrading conditions for workers, broken equipment and security breaches. Records from Sydney International Airport, for example, show 132 injuries were reported in Aerocare’s workforce of 324 in just 12 months.